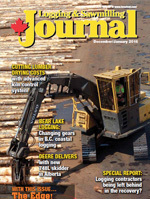 Logging & Sawmilling Journal December/January -Too low logging rates - a threat to the industry? Too low logging rates - a threat to the industry? Although logging rates have recovered somewhat since the depths of the Great Recession, there is still widespread concern about low contract rates among loggers right across Canada, and this situation threatens to undermine the entire industry. A common complaint heard among Canadian logging contractors these days is that while forest companies seem to have recovered from the 2008 industry downturn, logging and haul rates have not bounced back to reflect today’s reality—and today’s costs. This has resulted in a tense relationship in many parts of Canada between loggers and their clients. Herman Derksen, owner of Northwest Harvesting in north-central Alberta, speaks plainly about how current logging rates are having a direct impact on how he manages his company. “The rates are not set up for you to be training people,” he said in an interview with Logging and Sawmilling Journal recently. In other words, because of how much he is paid compared to the cost to run his business, he can’t afford to keep operators employed if they can’t ramp up quickly to meet daily production targets. Derksen said he can’t afford to operate at less than peak productivity—all the time—just to pay the bills. Compared to when he started logging in 1998, he said that “fuel, expenses and employee wages are way higher, so the potential for failure is way higher. During the 2008 downturn, Derksen halted all new equipment purchases, but as all contractors know, there comes a point when equipment wears out. That opens up a new can of worms for logging contractors nationally as it relates to rate negotiations—the influence of the exchange rate between the Canadian and American dollar on the current cost of equipment. Darcy Coleman, owner of Coleman Forest Products in Sundre, Alberta, says that he anticipates that the cost to replace his Komatsu 450 tilting feller buncher will likely be about $140,000 more today, because of the exchange rate differential. Yet logging rates have largely remained the same since the day he bought it new in 2012. Wayne Lintott, General Manager of the Interior Logging Association (ILA) in Vernon, B.C., with 385 members as far north as Prince George and as far south as the American border, says that logging rates in the B.C. Interior dropped about 11 per cent during the downturn in 2008. They have gone back up, but not to the point where they reflect current operational costs and where contractors are satisfied. Over the last decade, some contractors in the B.C. Interior have also undergone a significant and expensive change in how they log. For years, loggers in the southeast corner of the province delivered logs tree length. While they appreciate the significant investment forest companies have made to reopen and refurbish area sawmills, now, as a condition of continuing to log in that area, many had to make the transition to an entirely cut-to-length logging operation in a steep slope environment. Lintott says that overall, dissatisfaction with rates is the number one concern among ILA contractor members, adding that if concern over rates is front of mind with contractors throughout their working day, that doesn’t make for a great relationship with forest industry clients. “Whereas 10 years ago they had a profitability that was very sustainable for their operation, now they are just breaking even or making a very small percentage,” says Lintott. He agrees that many logging contractors have now also taken on log hauls to subsidize their their logging operations. Some contractors say they have taken it on because they simply can’t afford to work with a separate log haul contractor and wait for logs to be delivered, as they are paid on the basis of cubic metres delivered to the mill yard. A similar concern with rates is happening on the B.C. Coast. Elstone says the trend toward the consolidation of tenures on both the Coast and B.C. Interior is a major factor influencing rate negotiations. Bill 13 allows B.C. contractors to seek arbitration if they feel their compensation is unfair, but according to the TLA, a change to the dispute mechanism—putting an emphasis on ‘fair market rate’ as a guiding principle—has tended to undermine what contractors can actually earn. However, there are different points of view within the logging community, and whether there is room for improvement in day-to-day operations. Some question whether loggers are operating as efficiently as they can. 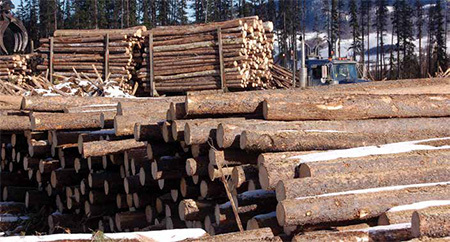 “Rates are one issue,” says Roger Nesdoly, general manager of Mistik Management in Meadow Lake, Saskatchewan, “but the actual (business) model, efficiency, attitude and ethic of individual contractors can vary greatly.” The company is owned by NorSask Forest Products and Meadow Lake Pulp, and is responsible for hiring logging contractors to provide wood for both these operations. While overall he says he works with a good group of contractors who first and foremost have a genuine desire to keep their clients financially viable, he sees significant differences on how individual loggers go about working with the rates offered. Like other parts of Canada, many contractors working in the Maritimes are also feeling financially challenged, but to address this issue, investigating efficiency is high on the agenda. Peter Robichaud, Executive Director of the Canadian Woodlands Forum (CWF) based in Truro, Nova Scotia says that he senses a greater co-operative spirit emerging among contractors and wood product manufacturers to work more collectively, so that the region’s small to medium size logging businesses can be profitable. CWF is a not-for-profit, membership-based organization that fosters communication, information and tech transfer to help improve business relationships along the supply chain and to help its members work efficiently and productively to remain viable. At present, it works primarily in the Maritimes, with its membership consisting of a number of key loggers, suppliers, and wood product manufacturers doing business in that region. While there are large companies like Irving prominent in the Maritimes, there are also many ‘generational’ sawmills operated by families, where the business has been passed on from one generation to the next. Like Roger Nesdoly working in Saskatchewan, Robichaud says there is a general local sense that raising contractor rates is not the only pathway to higher profitability. Ultimately, the way that contractors operate day-to-day has a direct correlation to wood costs and contractor viability. “The companies recognizing that say, ‘you know, we’ve got to do something here or else we just won’t have anyone left to cut wood’,” says Robichaud, and what’s interesting is that Irving has been at the forefront of this initiative. But what happens in situations where contractors do become more efficient and are penalized for doing so? Wayne Lintott says he is familiar with at least one situation in the B.C. Interior where a logger did take steps to become more efficient with a new multi-stemming processor head. The outcome? The forest company reduced the logger’s rate because they realized he had taken steps to put more money in his pocket. “Where’s the incentive to become more efficient?” Lintott asks, adding that this practice of penalizing contractors who become more efficient has been going on for years. Unfortunately, this tactic of penalizing contractors on their rates once they become more efficient is not exclusive to the B.C. Interior. It seems like a fairly widespread practice with the consequences now coming home to roost, as some contractors have shown a reluctance to participate in any activities or initiatives launched by forest companies purportedly to help them work more efficiently. All too often they feel that this has simply become an excuse for wood product manufacturers to reduce logging rates. Bill Sauer, General Manager of the B.C. North West Loggers Association (NWLA), with its members operating primarily in the Terrace area, says his members know all about efficiency, since most make their living bidding on BC Timber contracts where the wood mix is typically 70 per cent pulpwood to 30 per cent sawlogs. That area of B.C. is a true free enterprise market, but it demonstrates what happens when markets drive prices to their lowest, most competitive point. Yes, Sauer says, his members are incredibly efficient and could probably teach other stump-to-dump contractors a thing or two about how to become more efficient. However, the downside is that with such an unpredictable source of income and so much downward pressure on prices, few are buying new equipment. Alberta’s Darcy Coleman understands that situation completely, especially given the current cost of equipment. He says one option his logging company is definitely considering is purchasing ‘lightly used’ equipment as replacements because they won’t be able to afford to buy new, given the current rate structure and exchange rate differential. Other contractors make no bones about what the current rates structure will force them to do, and that is simply to hold onto equipment longer, commonly known as “bubble-gumming” equipment. Some logging contractors worry what influence current logging rates and the mountain of paperwork that comes along with the job will have on young people thinking about a career in logging. Despite the financial challenges, there are many older or retiring logging contractors eager to pass on the business to sons and daughters. Some are trying. The question is, will they survive at today’s logging and haul rates? Dave Legg, Manager of the Dryden Forest Management Corporation, understands this situation all too well, reporting that logging rates in his area have not increased for many years. The Corporation manages a Sustainable Forest License (SFL) representing about 118,000 hectares of productive forest, consisting of 16 shareholders all of whom are loggers. This includes five active loggers in the Dryden Forest, two logging elsewhere, with the remainder either retired or no longer logging. One issue pertaining to rates that is rarely considered is the cost of logging today, versus the “good old” days. A lot of the easy wood has already been harvested. A recent new trend that will definitely have an influence on logging in general throughout Canada over the short term is the downturn in the oil patch and the sudden availability of experienced equipment operators, which could influence wages now that there is less competition for employees. Coleman says that at one time when they advertised for a processor operator, they might get one or two applications. A recent advertisement resulted in 50 applications. Both Peter Robichaud in the East and Wayne Lintott in the B.C. Interior say their members are aware of this sudden availability of workers, but they aren’t depending on it.